A tankless water heater is a small but powerful and efficient water heating system that heats water as you use it, so you don’t waste energy heating and re-heating water that is sitting in a storage tank. The U.S. Department of Energy states that heating water is the biggest singular source of energy consumption for most U.S. households, so heating your water more efficiently can make a significant impact on your overall energy usage. 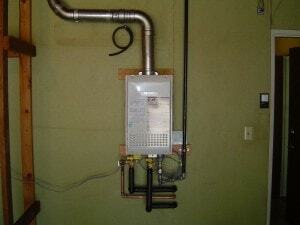 This Noritz heater produces a higher volume of hot water than other tankless water heaters in its class. Other, smaller units only produce enough water to run one major fixture at a time, so you may have to choose between the shower and the dishwasher. Not with this unit. The Noritz produces enough hot water to run four showers at once, and the water never runs out, so there’s no waiting for more water to heat up. With this unit you get all the energy saving benefits of a tankless water heater without the inconvenience that many units create. The Federal Government offers a tax credit for tankless water heaters of 10% of the cost of the unit and installation, up to $300. To learn more about the rebates go to the Energy Star Website. The unit is much smaller than a standard water heater.